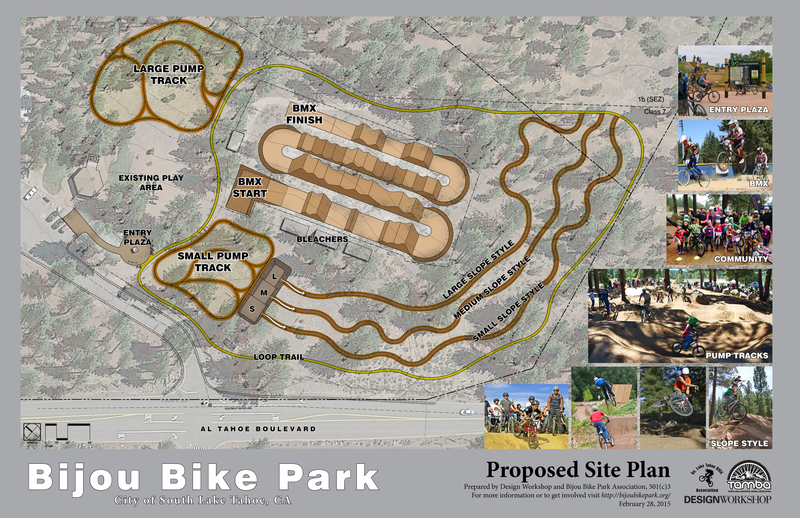 On Tuesday March 3, 2015 the City of South Lake Tahoe’s City Council will vote on entering a partnership agreement with our volunteer group to construct the Bijou Bike Park. We need your support on this vote by telling the City Council members the benefits of the bike park. Please write a comment letter to council to make sure this vote passes, or if you have the time to make supporting comments in person attend the meeting (9am, City Council Chambers, at SLT Airport). – The bike park is a recreation facility similar to sports fields, the skate park, the dog park and other existing uses in this public park. It is a missing amenity in high demand that the City can easily provide for the community and visitors. – The Bijou Bike Park will be a high visibility project for the City with potential for national press. It complements trail projects occurring in the surrounding National Forest and summer improvements at Heavenly. Letters should be addressed to the City Clerk and All Council Members. Read the full staff report with background information here. There is still a lot of work ahead, including finalizing the TRPA permit, contracting the build, construction. This has been almost 4 years in the making and there is a noticeable tide shift in Tahoe recognizing the importance of bikes, our collective voice is being heard! To get involved and find out more fill out the email form on our contact page or talk to us in person. Thanks!